At tonight's hooking in St. Andrews there was 3. Sandra, Susan and me. Susan was finishing up a chair pad that was a nice combination of colours. Golds, I'd say. We thought about whether when you finished it was when you finished hooking or when it was completed. I guess either one works. Sandra was starting a new hit or miss mat. She has a scale basket full of worms. This new mat has a heart in every other block and four small blocks in the alternate block. She is hooking the small blocks in outline with bright colours. I am still working on the American Quilt pattern by Carolyn Buttolph and using up Wool of the Month. 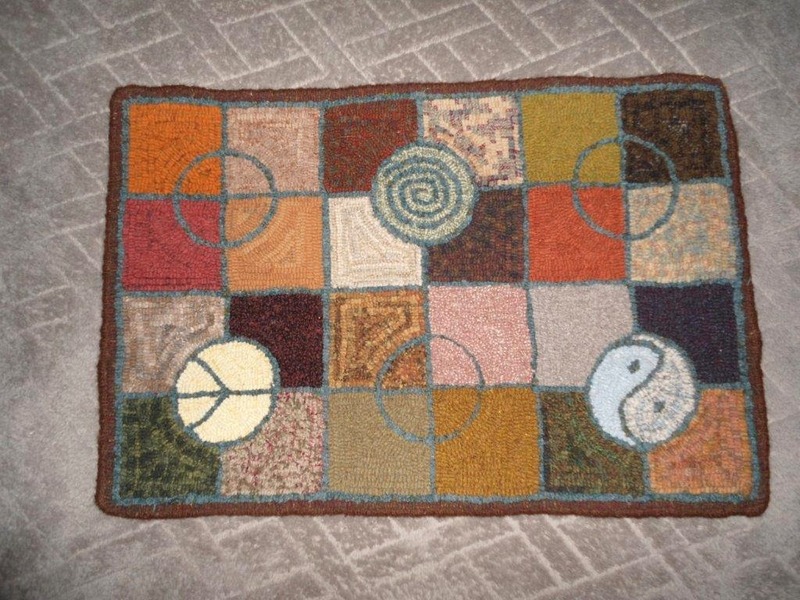 This is the second rug of this pattern that I have made and I can't decide how to hook it. I keep changing my mind as to what wool to put where so I spend a lot of time just looking at it all. Very enjoyable evening. Next time I will take a camera. It seems that for months and months Wednesday nights have been bad for driving. Tonight was no exception with rain at times heavy and fog. I noticed a Mama Turkey with several babies on the way to St. Andrews last Sunday evening. She was one big Mama. I would hate to run into her on the road. Normally I don't mind driving but I went to Calais looking for plastic knives strong enough to cut steak this morning and tomorrow I have to go to St. John. I hope what I bought works out for my husband's Trap Shoot on Saturday. (I tried them on Shake and Bake chicken and they cut pretty good.) I have also been volunteered to make chocolate chip cookies and Caesar Salad. Add to that list my quilting group is hosting a quilt show on Friday and Saturday in St. George and I am trying to put the binding on the last of 3 scrappy quilts. I said in passing to my husband, "Who would have imagined that there was that much fabric in my sewing room?" and he raised his hand. I had to laugh at that. I can't sleep tonight because I started to think just as soon as I got into bed. I started to read and I found a slip of paper in the book that said, "Give me coffee to change the things I can change and wine to accept the things I can't." I don't know who wrote it but it would make a great rug. That is when I decided to get up and turn the computer on and look at Rug Hooking Daily and Facebook Rug Group. Then I checked to see if I had won the lottery but I still don't know because I would have to get up and find the ticket to check it. Next week I hope to get back to the hooking. With the scraps all sewed together I now have room for wool and I can sort it into colour groups. I should take a road trip and look at wool and rugs. I think Nova Scotia is a good place for that and I may just get up some morning and go. Weather and turkeys permitting. Last year KnitEast was held at the Algonquin, the W. C. O'Neill Arena Complex and also Sunbury Shores Arts & Nature Center in St. Andrews. Knitting classes were held at the Algonquin and the Arena hosted vendors with a marvelous selection of yarns and knitted goods. 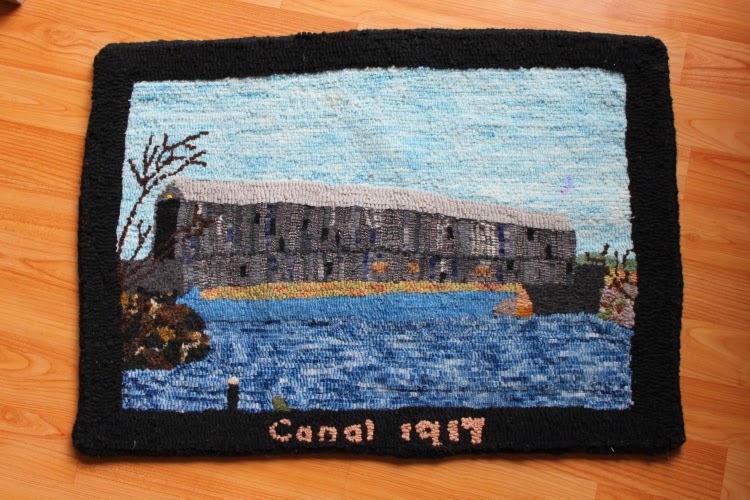 A rug hooking workshop with Celia Charlton on Landscapes was held at Sunbury Shores. With about 9 participants we had lots of one on one time with Celia who was challenged with a diverse choice of landscapes. There was a close-up of a tree, a light house, a mountain, a house and fields, and everything in-between. Celia is a wonderful great teacher who gave us tips on bringing the best out of our choices and our wool. I am looking forward to another Knit East and I hope I have my mat finished before then. I have admired this cheerful little guy all the while Sandra was working on him and I am happy to see him finished and ready to hang around. Sandra dyes her own blues for her rugs and they make whatever she is working on stand out. Great job, Sandra. The New Brunswick Rug Hookers have been very interested and supportive of the Hooked Rug Museum of North America in Nova Scotia and have been willing to hook and donate rugs. These wonderful people have hooked on group rugs and individual rugs. As is very apparent by the piece linked below they are very proud to have their mats displayed. New Brunswick rug hookers are on the Saint John Community TV, just click the link below to view. 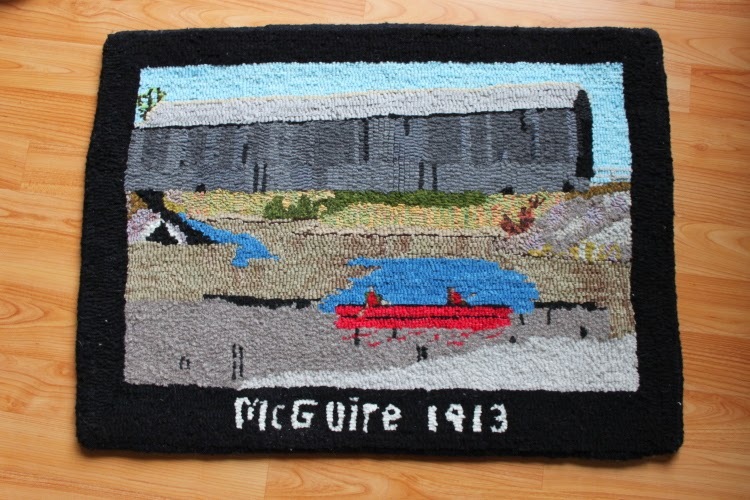 Several members answered the call by Pat Neill to hook rugs depicting New Brunswick Covered Bridges. Some hooked bridges from their local area and others hooked bridges that represented something to them. 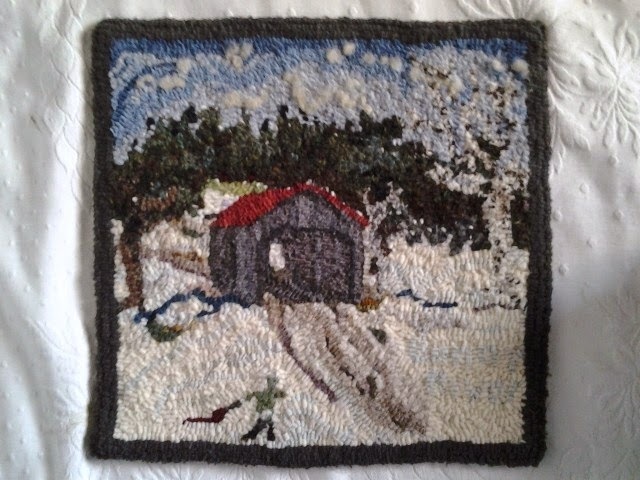 The rugs have been donated to the Rug Hooking Museum of North America in Nova Scotia. Canal Bridge is located on the St. George end of the Quoddy Loop. This is the bridge hooked by the Quoddy Loopers Group. The Canal Bridge suffered some damage in the last year or so and we are happy to say that it has been repaired and is still a treat to drive through. Sandra Lewis chose the McGuire Bridge that is located in Elmsville. It is located in a northern direction from St. Andrews as is the Digdequash McCann Bridge hooked by Maureen McIlwan. Both of these bridges span the Digdequash River and are still standing. I chose to hook the Linton Stream Bridge which is located in Bonny River. As I child I spent time at my Aunt and Uncle's house which was located right beside the bridge. As a child my Mother earned money in the winter by shoveling snow into the bridge so the sleighs could travel through. Sadly this bridge has been gone for a long time. 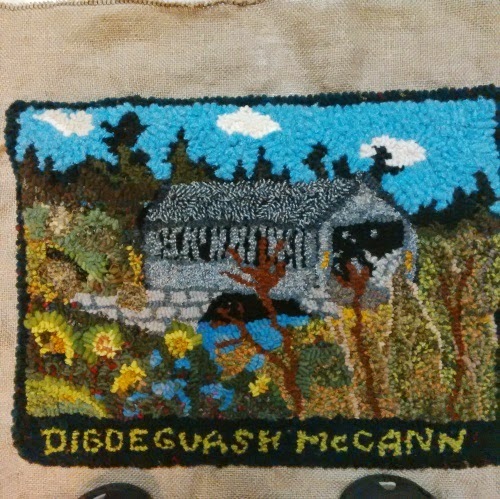 The Quoddy Loopers group hooked the rug, " Cottage Craft Shop", (above) to donate to the Ross Memorial Museum for their special show honouring Helen Grace Mowat and the Making of the Cottage Craft 9014 - 2014. Helen Mowat started the Cottage Craft to give the rural women of Charlotte County, New Brunswick an opportunity to earn an income from their craft - knitting, weaving and rug hooking. 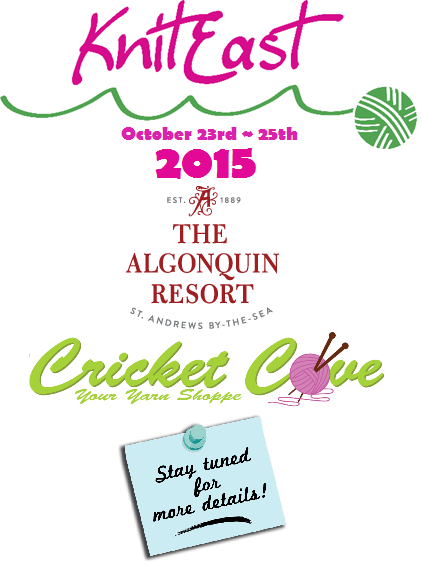 Raffle Tickets for the donated Cottage Craft Shop rug are on sale now. Raffle will be held in October 2014. Everyone was very surprised to see 10 people together after a long winter of cold temperatures and bad roads. It seemed that every Wednesday night I settled down and stayed home because of one or the other and I am sure that many others did as well. With the time change coming up in a week or two there will be more light and travel will be easier. Mary Jones, Susan Waddy and I each brought new books to pass around and Sandra Lewis brought a huge bag of recycled wool to share. Sandra has started spring cleaning. For Christmas I bought myself the book "Hooked Rug Storyteller, The Art of Heather Ritchie" by Lesley Mary Close. I have read it from cover to cover and it is a wonderful book full of pictures (many close up), stories and tips. I have finished 4 rugs since last fall. Now I am making a scrap quilt so that I can get rid of the fabric and have room for wool. Honest, I am only buying what I need from now on and I don't need more fabric. It's getting difficult to find a place to store everything. With 2 hook-ins just a month away I can't imagine not buying new wool so I may have to start cleaning my sewing room soon. A Big Boned Girl designed by Deanne Fitzpatrick. I made this Yoga Person for my friend Nancy and gave it to her for Christmas. Another rug given as a Christmas present, to my brother-in-law, was a scrappy mat made with wool-of-the-month from Sande Gunning's shop River Gallery and Textiles. For me to keep it's a mat designed by Carolyn Buttolph and again I used wool-of-the month from River Gallery and Textiles. She named it "American Quilt." Check out Sande's website at www.rivergallery.ca. Well, It's a new start for the Quoddy Looper Blog. My ability to write and to hook are certainly not the same caliber as Maureen's but I am willing to give it a go. Even though the blog seemed to come to a stand still the Quoddy Loopers have not. Weekly hooking and yearly hook-ins have kept us in touch with fellow hookers and solitary time with our mats and wool and hooks have kept us adding to our collections. It is hard to know where to go from here but now that I have managed to get into the blog and see how it works I am almost positive that inspiration will strike. Impossible! Where did the time go? Things have been moving along, but posts to the blog are not keeping pace. Apologies for that! Quoddy Loopers continue to meet weekly, but sadly, I am no longer there. A dream job came up for my husband and we moved, leaving idyllic St Andrews and the whole marvelous east coast for central Canada. We are now condo dwellers, in the midst of Toronto. On the plus side, I've already found a congenial group to hook with. But then, aren't all rughooking groups friendly? They are, in my experience. I joined the Upper Toronto Group and may get to the Agincourt group as well. For now, I am still settling the astonishly vast amount of wool I've amassed over the last several years. It was squirreled away in various spots in our little New Brunswick house, but is now overflowing the shelves and nearly out the door of the little solarium that is to be my new rug/sewing room (the +1 of our 2+1 condo); lovely eastern light with a full wall of windows, but tiny. Maybe this week I will make more progress. The rug that consumed me at the end of my NB stint was the St Andrews mat I'd begun five or so years ago. Specifically with no deadline. However, as they say, life had other plans for me, and a push was on to get it finished before I left town. The Loopers pulled together and we had a few group sessions, where everyone worked on the mat together, around a quilt frame, finishing the lettering and rest of the border. Please respect the various designers' work on these pages. Enjoy them at your leisure but do not take images away from the blog or copy them for any purpose. Thank you. Where I know the commercial designer, I have specified; feel free to contact those who sell the patterns. Quilt patterns make great geometric rugs. Or draw your own! Especially for primitive style rugs, just let your pencil wander and play with your inner child. Mark your calendars: Saturday, the 5th of November, 2011. 10am to 3:30 pm. Lunch and treats for everyone, but please do tell us you are coming so we won't run out of food! Saturday, November 6, 2010 at the Catholic church parish centre, corner of King & Parr Streets, St Andrews, NB (Canada). If you wish to contact me, please do so using the comments link under one of the posts. While I am not on the blog daily, I will get a message from google if you leave a comment. BREAKING FREE Be prepared to have your Mind Blown! ONE Whole YEAR Away From Blogging......Seriously! Visit Kingsbrae Garden on Facebook!